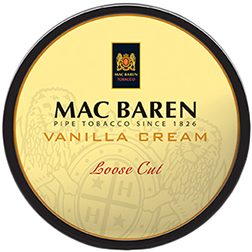 Mac Baren pipe tobaccos offer a delightful world full of scents and tastes derived from years of expert blending and exceptional craftsmanship. Each Mac Baren pipe tobacco blend is uniquely special, and these recipes are closely guarded secrets known to only a very few. Explore the world of Mac Baren classic, 7 Seas, and HH blends. Black Ambrosia is blended mainly with pure Virginias, which have been carefully roasted to bring out the tasty and sweet Cavendish. To this Cavendish, Mac Baren has added some very special yellow Virginia tobaccos to give the blend a beautiful contrast. Enjoy the exciting taste and sweet aroma. 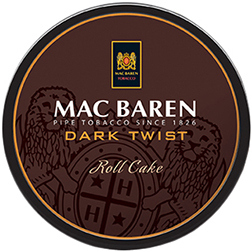 A full roll cake tobacco for special moments, Dark Twist is round in taste and quite characteristic. The specially spiced, dark Cavendish ensures its pleasant taste and harmoniously matches the choice Virginia tobacco. 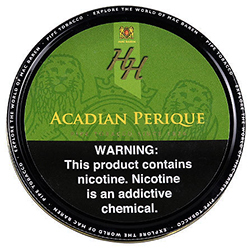 Virginias, Burleys, original Cavendish, dark fired Kentuckys, Orientals and a fair amount of perique tobaccos make HH Acadian Perique a rich and flavorful smoke without tongue bite. You'll enjoy only the pure and satisfying tobacco taste with no top flavor. 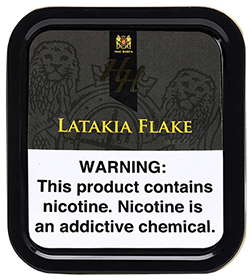 HH Balkan Blend is comprised of choice Virginias, Burleys, Orientals, and Cyprian Latakia. This English blend shares smoky and spicy notes from the Latakia and Oriental tobaccos. 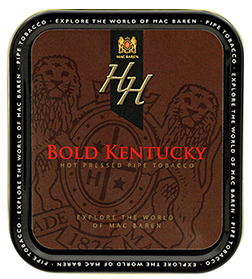 HH Bold Kentucky contains an ample amount of the finest dark fired Kentuckys from the USA and Africa combined with Bright Virginias to soften the taste a tad. The taste is of earthiness with just a touch of sweetness from the leaf itself and the hot press, which brings the different tobaccos together. Mac Baren's HH Burley Flake is a classic blend using ripe Virginias and a touch of dark fired Kentucky to complement a Burley base. It's a pleasant and mellow smoke with a woodsy taste. Latakia is front and center with Virginias offering a bit of sweetness, Orientals adding spiciness, and the Burleys provides nut and earth components. The blend is hot-pressed to marry the flavors and add complexity. 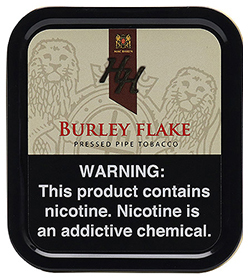 A bold blend of dark fired Burleys and flue cured Virginias, this flake is hot pressed to develop a bolder tobacco. The robust, earthy flavor of the Burleys takes center stage for a very satisfying smoke. Pure flue cured Virginias are all you'll find in this thin-cut flake as the name implies. Made without any topping and only a minimal casing, you'll enjoy a natural sweetness and purely Virginia smoking experience. Mixture Modern is a blend of the traditional Cavendish and a larger proportion of Mac Baren's mild Cavendish. Where the mild Cavendish imparts sweetness and lightness to the blend, the traditional Cavendish adds an intriguing depth. Mixture Modern contains a mixture of loose cut and ready-rubbed tobaccos. A mild and lightly aromatic Scottish Blend, Mixture combines ready-rubbed, matured Virginia tobaccos with golden brown Burley grades, Cavendish, and loose, ripe Virginia. Select Burleys, Virginias, and Mac Baren's original Cavendish are blended, pressed, and then stored for weeks before sliced. Navy Flake is a very enjoyable cool and slow burning blend. Original Choice is a delicate blend of Virginias and Burleys with a delicious aroma and taste and no tongue bite. The perfect choice for today's younger generation of pipe smokers. 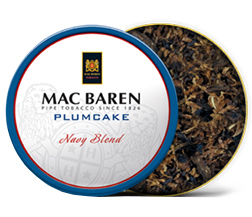 Plumcake is a Navy blend with a mixture of fully ripe Virginia tobaccos, sliced, cask-mellowed Burley tobaccos, and dark, spicy Cavendish. To give this blend an elegant aroma, Plumcake has been flavored with aged Jamaica Rum. 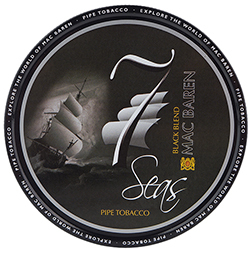 As with Mac Baren's other 7 Seas tobaccos, Black Blend is made using American tobacco blending traditions to produce a flavorful aromatic blend with a velvety feel and no bite. Black Blend is a loose ribbon cut of a Virginia tobacco blend toasted to a deep black. The flavorful Black Blend trends toward the sweet side with subtle notes of vanilla and amaretto. 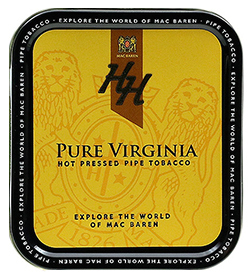 Mac Baren's 7 Seas Gold Blend is a bright and aromatic blend with Virginias and Burleys in perfect combination. The smoke has a gentle light and sweetness with notes of soft creamy vanilla. 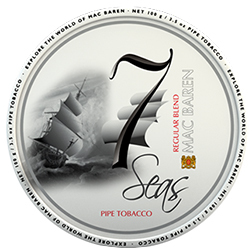 Mac Baren's 7 Seas tobaccos are American-style aromatics with a velvety feel, no tongue bite, and a huge amount of flavor. Mac Baren's 7 Seas Red Blend pipe tobacco uses sweet, rich golden Virginias, brown Burleys, and a touch of Black Cavendish. It's a mild aromatic blend with a flavorful taste of wild cherries - slightly tart and not too sweet. 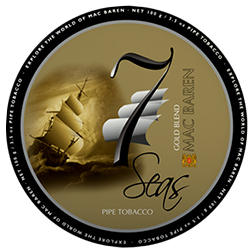 Mac Baren's 7 Seas Regular Blend is an aromatic blend of golden Virginias, light brown Burleys, and Black Cavendish. A sweet and light taste with a foundation of vanilla and notes of rich chocolate will greet you upon lighting. 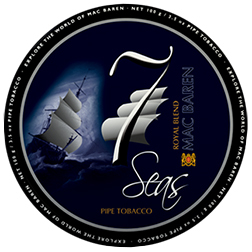 Mac Baren's 7 Seas tobaccos are American-style aromatics with a velvety feel, no tongue bite, and a huge amount of flavor. 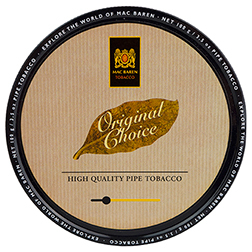 Enjoy the beautiful color match of Mac Baren 7 Seas Royal Blend's golden Virginias, light brown Burleys, and a touch of Black Cavendish. Upon lighting, you will be met by a gentle sweetness, a base of vanilla, notes of mild and sweet honey, and a faint fruit overtone. Mac Baren's 7 Seas tobaccos are American-style aromatics with a velvety feel, no tongue bite, and a huge amount of flavor. 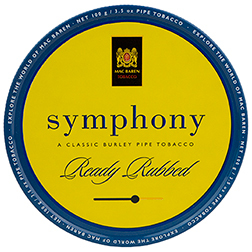 Symphony is a harmonious blend of Kentucky Burley, Virginia, and Cavendish tobaccos, ready-rubbed to deliver a light sweet taste. Vanilla Cream is a colorful blend mixed with cut plugs. Manufactured from specially selected and aged Virginia and mild black Cavendish tobaccos it is then blended with an exceptional vanilla flavor. This selection creates an outstanding blend with superior flavor, unique aroma, and distinctive taste experience. A ready-rubbed tobacco of exceptional, matured Virginia tobaccos, which brings about this non-aromatic blend's medium strength and characteristic sweet taste. 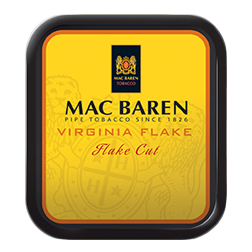 Virginia Flake is blended from choice, fully ripe, and matured Virginia tobaccos. A touch of top flavor is added to enhance the natural sweetness of the Virginias. 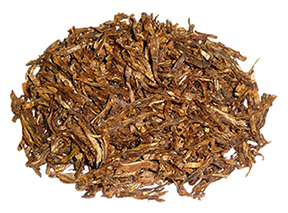 Virginia Flake is a cool and mild slow burning tobacco with a pleasant taste.